The Advertising and Flight Information Display System (AFIDS™) is an affordable solution for the display of flight information, advertising, news and messages. AFIDS™ is modular in design and consists of Flight Information Display, Multimedia Player and News and Information Ticker display modules. This modular approach allows for a variety of configurations and on-screen layouts. Each display module is scalable which allows AFIDS™ to be used on a variety of display types (plasma, LCD or CRT), display resolutions and aspect ratios. AFIDS™ server-side modules include a News Server which is configurable to retrieve news information from Internet news sources and packages them for the client-side AFIDS™ News and Message tickers. The AFIDS™ Flight Information Server module can be configured to interface with third-party flight tracking systems. Rental of AFIDS™ to media suppliers. Rental of advertising space provided by AFIDS™. Sale of sponsorship for news and message information. The Flight Information Display module not only displays flight information, but can be configured to switch between flight information and advertising as well. The Flight Information Display module can link directly to any HTML (web) or web service based flight information server. The AFIDS™ Flight Information Server module can also be congigured to interface with third-party flight tracking systems. The AFIDS™ News and Ticker module is used to scroll headline news, corporate news, stock indicators, sports news, weather, announcements and general messages across the display. The ticker content is retrieved from the AFIDS™ server based News Server module at regular intervals, so the content is always up-to-date. The AFIDS™ Multimedia Player module is capable of displaying video, Adobe® Flash® and static image content, for example video commercials, news headlines and weather reports. The playback is controlled by a schedule, which is retrieves from the AFIDS™ server. The AFIDS™ Control Centre is a non-visual client-side module, which runs in the background on the client system and performs a multitude of tasks to ensure optimal client operation. 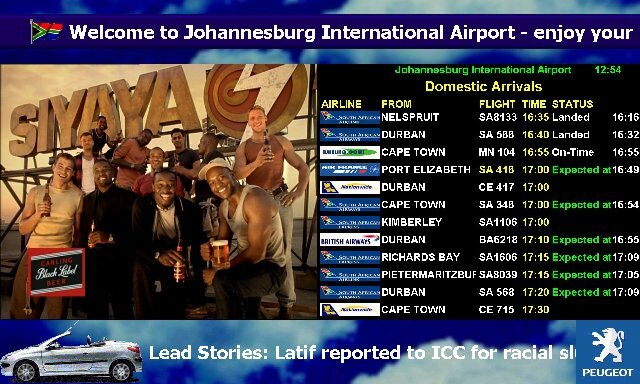 (South Africa) 50+ AFIDS™ powered screens located in the internation as well as domestic departure and arrival halls of Johannesburg's international airport (FAJS).